Green Lane House is a magnificent three storey building that is situated on the corner of Green Lane and St Peter’s church yard. It is something of a local landmark due to its distinctive twin towers. The building was built as a Methodist chapel in 1878. Green Lane has a number of impressive 19th Century buildings along it including Gower Street Chapel, the gothic University Arts Centre, Green Lane House and of course the Hippodrome. Many of these buildings have unfortunately fallen in to disuse throughout the 20th Century. However, plenty of them are now enjoying a renaissance as they are repurposed for 21st Century whilst sensitively preserving their architectural heritage. The building was identified as a priority for restoration in 2016 as part of Derby City Council's Townscape Heritage Initiative. Now the scaffolding is up around Green Lane House as it undergoes its multimillion pound refurbishment led by Akorne Ltd and 70% funded by Heritage Lottery Fund investment. The work is due to be completed in early 2019, at which point most of this building will become part of the public realm and an exciting addition to St Peter’s Quarter. The City Council and the developers intend the finished building to be multi-use. The ground floor and the basement floor will be retail space. The developers hope a theatre company can base themselves on the upper floors, using the space for rehearsals and as a home from which they can operate. The upper floors would also work very well as an art gallery, increasing the number of local art venues for the general public. On the outside, the restoration of this building will undoubtably provide Green Lane and St Peter’s Quarter with a huge aesthetic boost and increased footfall as well as encouraging further investment in the area. Although it’s early days it is possible that these redevelopments in close proximity to each other will kick start a new arts scene in the region with Green Lane being at the very epicentre. Certainly, many of the key ingredients are starting to be introduced. Green Lane already has some amazing independent restaurants and soon carefully restored historic buildings will house new residents. With Green Lane House hosting theatre companies and a public art gallery alongside the existing University Arts Centre, this area could quickly develop its own unique micro-culture. The only essential ingredient that still remains to be added is the Derby Hippodrome itself. The Hippodrome would provide an important performance space for local talent as well as being a key entertainment venue for the city. The Derby Hippodrome Restoration Trust continue to work towards the goal of a restored Hippodrome and now momentum is gathering in the neighbourhood that might allow this vision to finally be realised. A chapel on the corner of Green Lane and Gower Street is currently undergoing a renovation and conversion to luxury apartments. The chapel was built in 1868, but during the later half of the 20th Century it was used as a bar and a night club. The building is now being properly restored preserving most of its external historic features. Internal original features such as stain glass windows, original beams and lintels will also be preserved. The redevelopment will comprise of 8 apartments spread across 3 floors. This is part of a package of redevelopments in the Green Lane area coordinated through the St Peter's Quarter Business Improvement District. Further down Green Lane at the junction with St Peter's Church Yard another historic landmark building, Green Lane House is now being converted into retail premises after a successful Heritage Lottery Fund bid. These developments create a healthy local environment for a restored Derby Hippodrome to survive as successful business and high profile entertainment venue. A Derby based architect supported by Derby Civic Society has now drawn up exciting plans for how Duckworth Square could be transformed into a entertainment hub for the city. This new area of the city centre has been dubbed “the Joseph Wright Quarter” after the acclaimed 18th Century artist. The entire development would be underpinned by a regenerated Hippodrome Theatre which would introduce a high quality venue for operas, musicals, classical music concerts, pantomime and ballets. The restored Hippodrome would perfectly complement the new Assembly rooms, the Guildhall Theatre and Derby Theatre to give Derby a full suite of entertainment venues for every type of event. 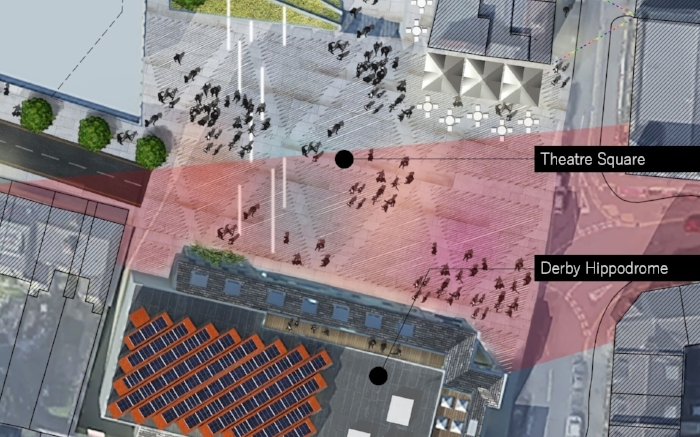 The proposed Joseph Wright Quarter would also contain an outdoor amphitheatre public realm space for informal outdoor productions, a University Plaza and Green pedestrian corridor as well as hotels and apartments. This new area would have an exciting character in its own right as well as further enhancing Derby’s beautiful Cathedral Quarter and bringing a huge boost to Green Lane and St Peter’s Quarter by seamlessly bridging the two.